Stunning and Spacious Floor Plan! You will love the unique style and the amazing full vault ceiling with display shelf,canned lighting. Bay window in living room. Freshly painted and new carpet installed 8/2018 equals MOVE IN READY! 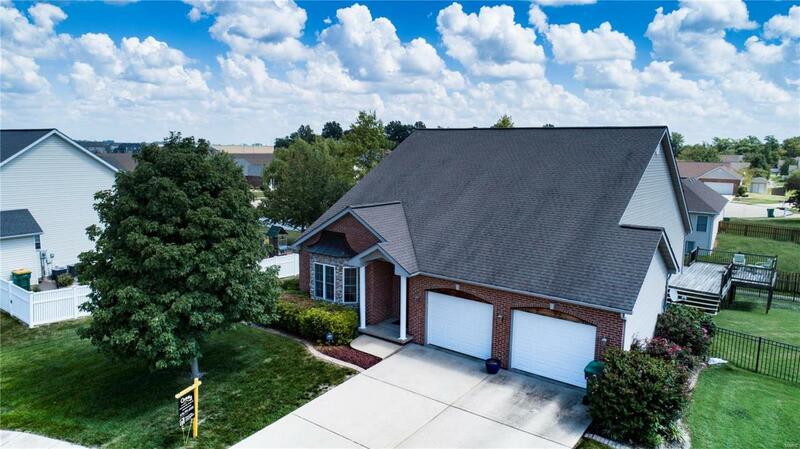 Close to Scott AFB and in Mascoutah school district on a cul-de-sac. Kitchen features 42" staggered cabinets with crown molding, stainless steel appliances, dishwasher 2018, wall oven, gas cooktop on center island with wine rack, touch faucet, magnetic child proof cabinet locks, pantry. Dining room is open to the kitchen and huge family room with gas fireplace and patio doors to deck. Master bedroom has vault ceiling, walk in closet and large master bathroom with garden tub, separate shower with jets and double bowl adult height vanity. Plenty of closet space including a walk in closet in bedroom 2 and 3. Main floor laundry. Full, partially finished basement has lookout windows, 9' pour and a finished room. 54" black aluminum fence by Chelesy 4/2018.